Although it has long been decommissioned, and ceased generating power for the city in 1983, Battersea Power Station’s four iconic chimneys have remained a much-loved feature of the London skyline. Originally built in the 1930s, the station is one of the largest brick buildings in the world and has been celebrated for its original, lavish Art Deco interior fittings and decor. The building was made even more famous and achieved the status of pop-culture icon after featuring in the Beatles’ film ‘Help!’ and on the cover of Pink Floyd’s album ‘Animals’. Due to its importance as a key part of Britain’s architectural and cultural history, the building was awarded Grade II listed status in order to ensure it would be preserved. In spite its notoriety, the structure was largely unused for decades following its closure and, in 2008, English Heritage described the condition of the landmark building as ‘very bad’, which led them to include it on their register of heritage buildings which are at risk. 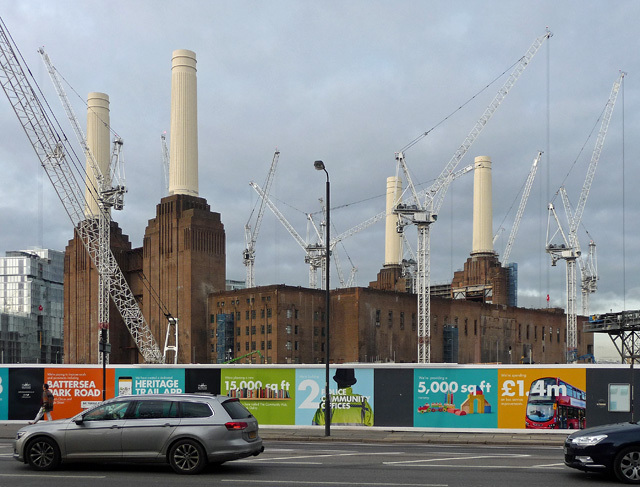 This has all changed with the current redevelopment of Battersea Power Station, which will preserve history and respect the integrity of this landmark while also breathing new life into the building and the surrounding area. The ongoing project will include eight phases in all, with Phase One already completed and Phase Two now underway. As global leaders in Building Maintenance Units, with an enviable record of installed solutions at many of London’s most iconic buildings, CoxGomyl were the natural choice of provider for this project, with the expertise and experience to deliver a practical building access system which is also sympathetic to the design of this historic building and the vision of the architects. The first phase delivered a vibrant mixed-use development known as Circus West Village which encompasses 753 residential apartments, office space, retail premises, a gym, community theatre, restaurants and bars. This project presented a number of challenges for effective building access including limited space, the need to navigate recessed building features and requirements for the BMUs to be stored within tight garage spaces when not in use. CoxGomyl met these challenges with seven 5000 Series luffing BMUs which are designed to accommodate the space restrictions, along with a davit system which offers 34 positions and a pantograph cradle design which provides access to recessed building elevations. This solution could be developed and implemented with peace of mind due to the use of 3D Building Information Modelling which helped identify the optimum accessing strategy across every elevation. Phase two of the redevelopment will concentrate on the iconic Power Station more directly, revitalising the building with a state-of-the-art events space, shops, restaurants and cafés, a public viewing platform, large open-plan office spaces, a 60 room boutique hotel, and a series of villas, apartments and penthouses positioned around a garden square above the Boiler House, and to either side of the Power Station. It will also be home to Apple’s new London Campus. Once again, this phase will present significant challenges for provision of vital building access due to limited space, building features and requirements for the BMUs to be parked out of sight in designated garage areas. Multiple track mounted mono jib BMU systems will serve the external elevations of the building at various roof levels and are designed to achieve a very compact height of just 1.6 metres in parked position. The comprehensive access solution also includes a series of monorails which support a modular platform which will serve the internal roof glazing and walls of the South atrium and a track mounted-gantry with a powered cradle suspended from the underside which will serve the internal roof glazing and elevations of the Office Atrium. During both phases, a key tool CoxGomyl were able to offer was 3D Building Information Modelling which helped identify the optimum accessing strategy across every elevation. This means every unique feature of this important building has been considered as part of developing and implementing the ideal building access solution.